This image is a “freeze frame” mission from Bianca Nieves y los Siete Toritos by Carrie Toth, using the app Goosechase. The team pictured was recreating the scene in which El Julí gets gored by the vicious bull, Sábado, complete with reaction from the crowd. Does it appear that these boys were “into it?” I think so!!! I first read about the app Goosechase in Maris Hawkins’ blog and Arianne Dowd’s blog last May. Last week, at the iFLT 2017 conference in Denver (which I vicariously attended through Twitter), Arianne mentioned Goosechase again in conjunction with a session by Darcy Pippins and referenced my use of the app. Since I had posted quite a few of my students’ completed missions from the last few weeks of the school year on Twitter and Facebook, they suggested I might blog about the experience. Additionally, I participated in a small part of a 10 day cultural exchange program with 49 middle school students from China last week. I used Goosechase with them successfully….after overcoming some language and tech hurdles! When Maris blogged about Goosechase she was studying directions and city vocabulary; Arianne used it with the novel La Hija del Sastre. The first time that I used it was with the novel that I wrote called Amigos, Abrazos, Aventura: Argentina. It was the end of May, our weather had been uncharacteristically cool and rainy for weeks, the kids were “blah”, just waiting for school to be over….I needed something new and instantly engaging. Goosechase was an immediate hit with my juniors and they requested to do it again. But, as Carol Gaab frequently says, “The brain craves novelty.” so, while Goosechase is a great activity, it is ONE strategy to go into the basket with all of the other strategies! I would recommend using Goosechase perhaps once a semester, certainly no more frequently than once a marking term. The second time I used it as one of the final activities with the novel Bianca Nieves y los Siete Toritos. Again, it proved to be an instantaneous success with my sophomores who also requested to do it again. The third time that I used it (last week) was to review all of the activities that the Chinese students had participated in over the week: visiting Assateague, the Ward Wild Fowl Museum, the Salisbury Zoo, a K9 presentation, etc. For most of those students it was a positive, enjoyable experience, but for several, the language was not comprehensible for them. The free app is easy to use. Students divide into teams (or you can designate teams). One team member has the app on his/her device (phone, tablet), logs in and searches for the name of your game. Once he/she finds it, a password is entered (optional, but I used one to make sure that only my students were progressing through the Goosechase), the students determine a team name (and can upload an image if desired….some do), and the missions become visible to them. The students can work through the missions in order or, as I did, they could randomly choose which to do first. The teacher assigns the point values for the missions, therefore if random is an option, some students might opt to work on the higher valued missions first. Goosechase bills itself as “a scavenger hunt for the masses.” I can see how it would be an excellent tool on a field trip to a museum, neighborhood, restaurant, etc. For me, I used it as review and reinforcement of material that we have covered….providing yet another repetition of comprehensible Spanish. I love that using the device, the students click “submit” and a video or photo is submitted in real time and I can view it as they are submitted. I can determine whether it meets the requirements and let the points remain (instantly added by the app) as stated, or delete the submission because it doesn’t meet the requirements OR add extra points if the submission is above or beyond what I expected. I love that there is a leaderboard that is being projected on my device (and that students checked frequently). There is also an activity feed, which shows the submissions in chronological order as well as a submissions page, where all submissions are gathered to be viewed in their entirety by points or by team. The free edition of this app allows for just 5 teams, which worked fine for me. I had students make teams of 4-6 students and that covered the class. Since I have multiple sections of each class, I just created the game two – three times, depending on how many classes. It sounds like a lot of work, but it really took less than 3 minutes to recreate the game once it was made. All of the mission that you create are stored in a “mission bank”, so it is merely a matter of going to the bank and clicking the missions you wish to include. There also is a master list of missions from the site itself and other users, but they aren’t really useful for me right now. Below are the missions that I used for my Argentina novel and then for Bianca Nieves. As I’ve already stated, my students really enjoyed the activity. They loved the novelty of it, the “escape” from the classroom, working with partners of their choosing, recreating what they had learned, and the competing to finish as much as possible in the time limit imposed upon them. The time limit is something that you set (and can adjust as needed during the game). Once time is ended, students are no longer able to submit missions and return to class. A colleague of mine used the Bianca Nieves Goosechase with her students and had similar success with one exception. She had a team of boys who decided to merely goof off during the Goosechase. This team accomplished one mission! She therefore had to “grade” the Goosechase, reflecting the fact that all other teams completed many missions to the one mission of these boys. I would suggest that you notify staff and administration well in advance of the Goosechase activity. Since students may be all over the school grounds during a regular class period, it helps that others understand what is happening. It might also be advisable to have each group carry a hall pass from you, the teacher. Below are some images from the two games. Unfortunately, I can not upload videos to this “free” version of wordpress anymore. I wish that I could upload the speaking missions, because I was really impressed with what my students could express “off the cuff.” And I REALLY wish I could upload the videos where they sang, danced or acted out (freeze frame or actions) scenes from the novels. I hope this helps give you a visual for this app. I would love to know what you might do or create with it! WOW!!! This is year 38 for me…….and it still feels brand new! This will be my eighth full year without a specific textbook, and my fifth “full on” CI intentional year (I was transitioning for several years from the grammar based, vocabulary list laden curriculum). Like so many other bloggers, (here are a few of them Allison Weinhold, Dustin Williamson, Kristy Placido,), I thought I would also share what I plan on teaching this year. Our school year is divided into 4 marking terms, with each class between 45 – 50 minutes in length. I will kick the year off with some great plans from Carrie Toth, using Atrévete . We will take about 4 days to go through this material, break for Labor Day and come back ready to plunge into the school year. La Llorona de Mazatlán by Katie Baker. This will be my 4th time teaching it; it has always been a popular novel and I have blogged about it extensively. My students become entranced by the legend, the music and all of the additional cultural aspects. They also really enjoy the “teenage love interest” in the story, although the ending always makes them mad. Día de los Muertos with some of the elements from this unit a few years ago. El Arte de Frida Kahlo, Diego Rivera, and, to a lesser extent, Pablo Picasso and Salvador Dalí. I’ve done some considerable blogging about this unit in the past. This will be the 7th time in this unit that has undergone a lot of change since it’s inception. It is now heavier on Frida/Diego and Mexican history, with less time for Picasso and Dali. This year I am excited to be adding the novel Frida by Kristy Placido for the first time. The novel Frida will carryover into Term 2. La Comida de México y Perú (and Argentina if there is time) I’ve been teaching this unit for 5 years and it is always a favorite. The original inspiration for this unit came from Kara Jacobs. Great music such as Mole by Lila Downs, the Cuy ads and songs from Peru as well as the Ñam Ñam Boys and the Anita/Beto ads for Inca Kola. Las Metas y los Sueños, an important “pre” unit prior to diving into the heaviest, most intense unit. I love this unit as my students explore their own goals and dreams and compare and contrast them with the stories of others (both famous and ordinary). I find that this unit is an exceptionally creative unit for them. Here is an example of what it looked like this past year. It does change from year to year, depending on the current fame of some individuals. The music for this unit is great, with past favorites including Vivir mi vida, No me doy por vencido, Creo en mi, La lista, No creo en el jamas and Celebra la vida. Vida y Muerte en la Mara Salvatrucha 13 (anonymous) This will be the third time with this novel and it has been a compelling read the past two years. Along with a background unit on the Civil War in El Salvador, the movie Voces Inocentes and parts of Romero, this is an eye opening, thought provoking novel that my students invest in heavily. It helps that they have just finished exploring their own hopes, goals and dreams as they look at the lives of the characters in the novel. The music in this unit includes Casas de Cartón, Gangsta, part of Razones (Bebe), Tu cárcel, Adentro, Nada Valgo sin tu amor and Así crecí. Immigration is always a “hot topic” unit where students are challenged by what they think they know and believe. We start with the Statue of Liberty, it’s history, poem and music and go from there. The music in this unit includes Welcome to America, American Oxygen, Wake Me Up, This Land is Your Land (bilingual version), Bandera, ICE, Pa’l Norte, La Bamba, and La Bamba Rebelde, Movies include 30 Days and Which Way Home. Immigration will carry over into Term 4. Narcoviolencia, which I’ve been teaching for 5 years (with original inspiration from Kara Jacobs and Cristina Zimmerman), is an ever evolving unit based on what is happening in Mexico with the violence, cartels, drug warfare, kidnappings and repression, etc. I always base the length of this unit on how much more “heavy” topics my students can continue to benefit from and grow. This past year we were only in it about two and a half weeks because we had spent so much time with Vida y Muerte and Immigration. The music in this unit, however, really draws them in: Lágrimas, La Patria Madrina, Have You Heard, México (Instituto Mexicano del Sonido) and La Llorona (43 Lágrimas) which brings us full circle back to the beginning of the year. If I have funding, I would like to purchase La Guerra Sucia or Felipe Alou. If not, I will probably do the novel that I wrote 2 years ago called Amigos, Abrazos y Aventura: Argentina. The year begins with a short 4 day unit from Carrie Toth, actually from a colleague named Paige, about the Cactus and the Bank. I also plan on using La Persona Especial (as developed by Bryce Hedstrom) with these students, who are all new to me and I’m new to them. I will adjust the questions to a Spanish III level. Esperanza by Carol Gaab, one of my favorites! Such a rich story with so many cultural components. For me, I think it is the perfect way to ease my Spanish III students into my style of teaching without any pressure. The story is written essentially in present tense, but lends itself beautifully to past tense retelling. It will also be their first experience with my pretty intense focus on and inclusion of music to not just enhance what we are doing, but to highlight, illustrate and teach. Ave que emigra is the first focus song of the year. A brief, 2 week Puerto Rico and food unit with stories written by me and my colleague, Megan Matthews. This is a good, light hearted unit and serves as a nice break from the seriousness of Esperanza. Día de los Muertos with the possible inclusion of Tumba by Mira Canion, dependent on funding. A short unit on clothing with stories written by me and my colleague, Megan Matthews. A longer 3 week unit on geography, animals and weather with stories written by me. This unit takes us to the Baltimore Aquarium for a field trip! We skipped this unit last year, and I really missed it. It will be interesting to see what changes are made to it this time around. Robo en la noche by Kristy Placido begins as we return from Christmas. Teaching it for the fourth time, this is a great book with so many additional elements with geography, environment, and just fabulous Costa Rica. A favorite song for many students is Pura Vida by Percance. Robo en la noche continues into Term 3. Jai-Alai, flamenco, music and sports from Spain come next, preceding the next novel Bianca Nieves y los siete toritos. Two favorite songs from this unit are Buleria (David Bisbal) and Dame Vida (Huecco). Bianca Nieves y los siete toritos by Carrie Toth I am looking forward to teaching this again and not feeling the pressure of the end of the year creeping up. I plan to use the Ferdinand movie again as well as Blood Brothers. I love the fact that Carrie got the present subjunctive into this book so naturally. Last year the students really enjoyed the bullfighting elements that easily flow from the novel. They also LOVED Reader’s Theater with this novel, so much that I worried about using it too much! Colombia and Juanes is a unit that I have been teaching in some form since 2005, and it has really undergone quite the transformation over the years. In its’ early years it also included the Dominican Republic (Juan Luis Guerra) and Venezuela (Carlos Baute) and was called my Social Awareness Unit. As the unit grew, it just became too large, so it got trimmed to just Colombia and Juanes. It is possibly my favorite subject material of all time to teach and was definitely the first unit that initiated my gradual conversion to CI. I love just about all of Juanes’ music, but the music with social messages is just phenomenal. In this unit we study the Civil War in Colombia, which just might be over (finally), the impact of drugs, Pablo Escobar, landmines and Juanes’ quest for peace, not just for Colombia, but for the world. I use the movie Los Colores de las Montañas, a beautiful movie. I love the stories that I’ve written for this unit and I love the impact that the unit has on students. On the end of the year evaluation/assessment of the course most students list this unit as their favorite, year after year. I have never taught it as the last unit of the year before, but I want to be able to give Bianca Nieves the chance to not be rushed this year. So, these are the plans. But, as all plans go, they are subject to change and evolution. Time will tell! My colleague Megan Matthews and I have had such great success with the TPRS Publishing novels the past two school years, and we would love to be able to use more of them. Unfortunately, in our school district we are plagued by financial issues and there simply isn’t enough money for us to purchase more at this time. We have, for the past 10 years, taught a unit on Argentina that is derived from chapter 10 in the textbook (that we do not use, but we are obligated to follow the curriculum). While we have tried to incorporate some of the vocabulary from that chapter, some of the grammar (the ongoing past tense development, the introduction of the present subjunctive and the present perfect), and some of the cultural differences between Buenos Aires and Washington, D.C., we were missing the structure, the fun, and the wonderful support of a novel. Over the years I had developed activities for that chapter that I liked, that the students enjoyed, and that served a definite cultural purpose, I was missing that reading and comprehensible input component. So, what happened? I got pneumonia! And I missed a lot of school! And I was bored! So, what did I do? 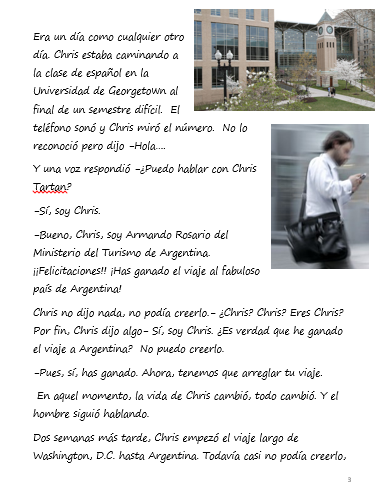 I started to write a novela about Argentina! I wrote the first two chapters and sent them to Megan, she wrote chapter three, I then wrote chapters four and five, she wrote chapter six, I wrote chapters seven and eight, we collaborated on nine, and I finished the book with chapters ten and eleven. What excitement!! So what I’m going to do now is share the beginning of this with you! Please keep in mind that I am no expert in the culture of Argentina, nor am I a native speaker. I began to write this novela “Amigos, Abrazos, Aventura, ARGENTINA!” to fit a definite need and purpose for my Spanish III students. The grammatical focus was specifically a continuation of the past tense, an introduction to the present subjunctive and an exposure to some present perfect. The cultural emphasis was on similarities/differences between Buenos Aires and Washington, D.C.(which is just a little over 2 hours from us), the geography of Argentina, the food of Argentina ( we tasted a lot of it! 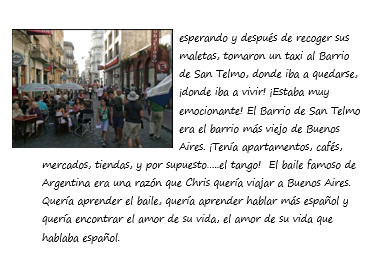 ), and specific areas (Iguazu, Ushuaia, las Pampas), el tango (we learned the basic steps to the dance and they LOVED it!) and a bit of soccer (although we ran out of time for this). The novela has a lot of dialogue (good for acting out the story), a bit of romance, a lot of mystery and an ending open to interpretation. I was able to include bits and pieces of my students’ favorite themes from throughout the school year, and the students came up with their own decisions as to what actually happened at the end….or maybe I left it open for a sequel! 1. Puedo identificar los países de Las Américas. 3. Puedo hacer comparaciones entre Buenos Aires y Washington, D.C.
6. Puedo escribir sobre viajes. 1. ¿Qué te gusta hacer o ver en la ciudad o el lugar en que vives? ¿Por qué? 2. ¿Qué te gusta ver cuando visitas una ciudad nueva? ¿Por qué? 3. ¿Qué te gusta hacer cuando visitas una ciudad nueva? ¿Por qué? 4. ¿Qué es una ciudad que visitaste en el pasado? ¿Qué hiciste en la ciudad? We followed that with Qué sabes de opening activity 2015 To complete this activity (with a partner), I also gave them the answers to the questions on a SMARTboard slide. Below, I am including the first chapter of this novel, which doesn’t include a lot of dialogue, but the dialogue really develops after the first chapter. I would really appreciate your feedback on it. Specifically, I welcome your criticism! I am thinking of perhaps pursuing having it published, even if I do it through something like TpT. I know that I would have to replace all of the pictures, but that is not too much of a problem because I did have my students draw pictures for specific chapters. If you find this interesting or worth pursuing, I would love to know. Thank you in advance for your feedback and time. 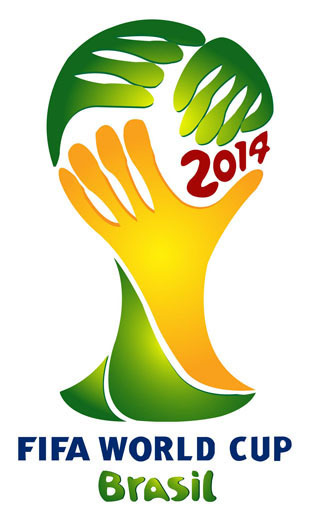 I have been collecting resources for La Copa Mundial 2014 for almost a year on my Pinterest board…..and now it’s almost here. I’ve also followed the incredible Zachary Jones, as he has created activities for La Copa, and of course, the fantastic work of Kara Jacobs. I will be starting my World Cup unit in two weeks (really it is a unit on several World Cups and soccer in general), and have created a page on my wikispace with my essential questions (similar to Kara’s) and all of the resources now divided by category: essential questions, informal and formal assessments, videos to support the essential questions and soccer in general, focus songs, additional songs, and useful links to articles, infographics, etc. During the next two weeks, I will be creating activities and worksheets to go with my focus songs and the songs that I will be comparing/contrasting (such as the multiple versions of La Copa de Todos/The World is Ours and Shakira’s 2010 Waka Waka with her 2014 LaLaLa), and also for several of the videos that will support my essential questions. All of the activities that I will create will be posted on that wikipage as I finish them and get ready to use them. I’m really looking forward to sharing the excitement with my students, and I welcome any additional material you might like to share! Argentina! culture, geography, reading, speaking and listening! My Spanish III students have been in the “travel” chapter. 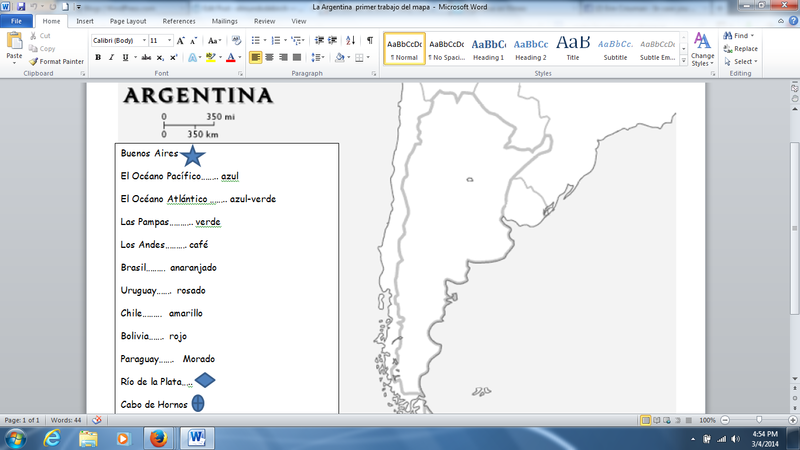 For the past 4 years, I’ve had my students “travel” to Argentina, and I have had them work quite a bit with maps and geography (two of the many links I use). One of the activities that I do is to have them compare Buenos Aires and Washington, D.C. Of course, initially, they don’t know what they are doing! The first thing I do is divide them into groups (no more than 4 students per group) and give each group a packet of laminated, full color pictures (all pictures are located on the powerpoint below, just separated). Those pictures include geographical markers, sports, food, government buildings, etc. I ask the students to categorize the pictures into no more than 6 groups, and to write the names of the categories they chose. Buenos Aires DC categorization student group sheet The back of this paper will be used for the similarity/difference activity the next day. I then asked them if they could guess the places/cities in the pictures. Of course, they came up with D.C. immediately, and because we had begun our preliminary introduction (Qué sabes de opening activity 2014) to Argentina, they guessed Buenos Aires. The next step was to divide the pictures into two groups: Buenos Aires/D.C. : quickly and easily done. We used this powerpoint Buenos Aires Washington, D.C. 2014 revised and started to talk about the similarities and differences between the two places. We continued this work the next day, but did not finish the powerpoint. 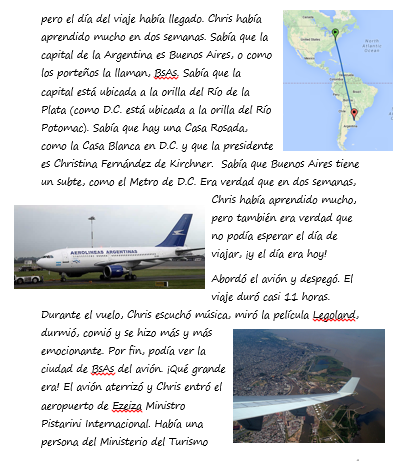 Instead, I gave them the packet of pictures again and this time, also gave them captions Facts for Buenos Aires Washington D.C.. I asked them to match the captions with the pictures. Two members of the group were responsible for D.C. and two were responsible for Buenos Aires. They had to share information with each other when they finished, and I then also had them choose one picture/caption from D.C., and one from Buenos Aires that they were responsible for “teaching” to each other. They practiced reading captions to each other, choosing the appropriate pictures, etc. We then finished the powerpoint, and each group completed the paper Buenos Aires DC categorization student group sheet with their similarities/differences. It always amazes me how much the students DON’T know about their own capital! A final activity with maps that was 100% engaging (again borrowed from a colleague): I gave a group of two students a blank map of South America in a sheet protector; the map had NO political divisions. Each student had a different colored dry erase marker and eraser. Their task was to draw all 13 countries and capitals, the equator, the Andes mountains, and label the oceans. I had to see approximately equal colors on their finished work to indicate that both partners had shared equally in the work. I was amazed at how intently they worked on this activity!